I've been looking through some old 'Slices; and I noticed a couple of items by the late great Robin Rew. In the first he says that he has "fitted a few 3.07:1 ratio axles into overdrive SE5/5a's as they will pull this ratio quite easily..... but that gearing is too tall for the 6 series" and I'm puzzled as to why that would be the case, given that all the models have the same engine? 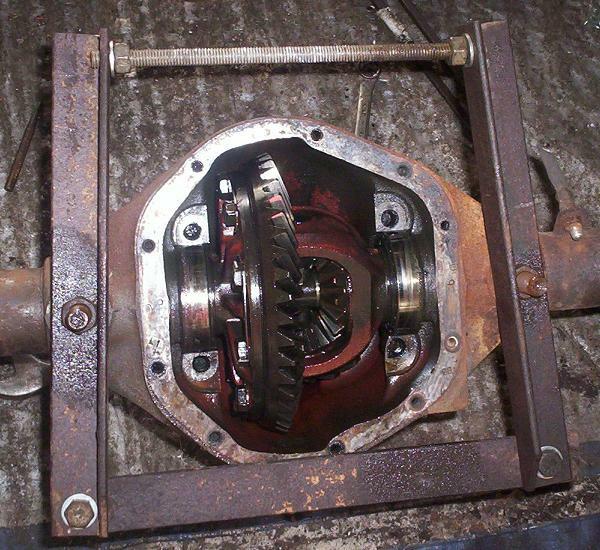 In the other article he says that spreading the axle casing is only necessary when fitting new diff bearings, not if reusing used-but-serviceable bearings. Is this correct? The 3.07 axle ratio works well in a SE5/5a but maybe due to the increased weight and increased frontal area it’s not suited for the larger cars . Never needed a axle spreader myself . Interesting replies! I have a surplus axle lying about. Can't quite remember where it came from but I might have a play with it to see how hard it can be before I start on the GTC! Right. I have the 'lid' off the axle, and I've taken the caps off the diff main bearings. I've arranged to borrow a slide hammer from the local garage to pull out the halfshafts, so after that the diff should be ready to come out. Is it just a matter of careful levering one side at a time, or is there more to it? Have the half shafts been out recently? If not, it’s unlikely a slide hammer will work. Half shafts will come out with a slide hammer, it's the hub that needs the skill and tools (like wot i az)! Never occurred that I could make my own spreader! I should have some angle iron lying around. I'm imagining a "U" of it, with the threaded rod on the open side to provide the opening force. But doesn't the rod have a tendency to bend under the strain? It seems Scimjim's prophecy has come true,the shafts aren't for coming out via slide hammering I undid the 4 bolts at the end of the axle, that 'should' be all that holds them in, so any other bright ideas? Thanks for the picture Gavin. Pretty much what I imagined, save that I had all the angleiron facing the same way, which is silly because they wouldn't fit together properly! I'll have a look at using threaded rod to push the shaft out. I'm going to need a more gentle method of working as one of my elbows has got damaged with all the crashing and banging the slide hammer about! as one of my elbows has got damaged with all the crashing and banging the slide hammer about!